(Phys.org) —In certain exotic situations, a collection of atoms can transition to a superfluid state, flouting the normal rules of liquid behavior. Unlike a normal, viscous fluid, the atoms in a superfluid flow unhindered by friction. This remarkable free motion is similar to the movement of electron pairs in a superconductor, the prefix 'super' in both cases describing the phenomenon of resistanceless flow. Harnessing this effect is of particular interest in the field of atomtronics, since superfluid atom circuits can recreate the functionality of superconductor circuits, with atoms zipping about instead of electrons. Now, JQI scientists have added an important technique to the atomtronics arsenal, a method for analyzing a superfluid circuit component known as a 'weak link'. The result, detailed in the online journal Physical Review X, is the first direct measurement of the current-phase relationship of a weak link in a cold atom system. "What we have done is invented a way to characterize a particular circuit element [in a superfluid atomtronic circuit]," says Stephen Eckel, lead author of the paper. "This is similar to characterizing a component in an ordinary electrical circuit, where one measures the current that flows through the component vs. the voltage across it." Properly designing an electronic circuit means knowing how each component in the circuit affects the flow of electrons. Otherwise, your circuit won't function as expected, and at worst case will torch your components into uselessness. This is similar to the plumbing in a house, where the shower, sink, toilet, etc. all need the proper amount of water and water pressure to operate. Measuring the current-voltage relationship, or how the flow of current changes based on a voltage change, is an important way to characterize a circuit element. For instance, a resistor will have a different current-voltage relationship than a diode or capacitor. In a superfluid atom circuit, an analogous measurement of interest is the current-phase relationship, basically how a particular atomtronic element changes the flow of atoms. Fig. 1 of the paper, reproduced with permission of the authors. (a) Absorption image of the ring and disk BECs with dimensions. (b) Example interference pattern when there is no current in the ring. (c) Interference patterns for various rotations of the ring, with arrows showing the direction of rotation. (d) Traces of the interference fringes. The experiment, which took place at a JQI lab on the NIST-Gaithersburg campus, involves cooling roughly 800,000 sodium atoms down to an extremely low temperature, around a decidedly chilly hundred billionths of a degree above absolute zero. At these temperatures, the atoms behave as matter waves, overlapping to form something called a Bose-Einstein condensate (BEC). The scientists confine the condensate between a sheet-like horizontal laser and a target shaped vertical laser. This creates two distinct clouds, the inner one shaped like a disc and the outer shaped like a ring. The scientists then apply another laser to the outer condensate, slicing the ring vertically. This laser imparts a repulsive force to the atoms, driving them apart and creating a low density region known as a weak link. The weak link used in the experiment is like the thin neck between reservoirs of sand in an hourglass, constricting the flow of atoms across it. Naturally, you might expect that a constriction would create resistance. Consider pouring syrup through a straw instead of a bottle—this would be a very impractical method of syrup delivery. However, due to the special properties of the weak link, the atoms can flow freely across the link, preserving superfluidity. This doesn't mean the link has no influence: when rotated around the ring, the weak link acts kind of like a laser 'spoon', 'stirring' the atoms and driving an atom current. After stirring the ring of atoms, the scientists turn off all the lasers, allowing the two BECs to expand towards each other. Like ripples on a pond, these clouds interfere both constructively and destructively, forming intensity peaks and valleys. 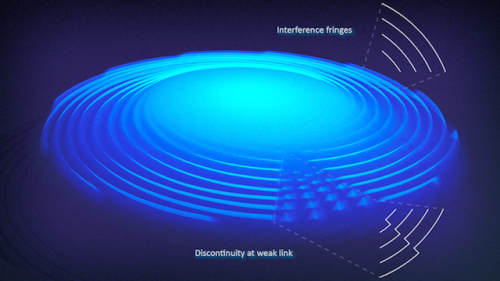 The researchers can use the resulting interference pattern to discern features of the system, a process called interferometry. Gleaning useful data from an interference pattern means having a reference wave. In this case, the inner BEC serves as a phase reference. A way to think of phase is in the arrival of a new day. A person who lives on the other side of the planet from you experiences a new day at the same frequency as you do, once every 24 hours. However, the arrival of the day is offset in time, that is to say there is a phase difference between your day and the other person's day. Fig. 2 of the paper, reproduced with permission of the authors. (a) Schematic of the atoms in the trap, with weak link applied. (b) Close-up of the weak link region. When the weak link is rotated, atoms flow through (solid lines) and around (dashed lines) the weak link. (c) The resulting density n(Θ), velocity v(Θ) and phase Φ(Θ) as a function of angle, with the phase drop γ across the weak link shown. (d) Method of extracting the phase from and interferogram (left). First, we trace the interference fringes around the ring (center), and then we fit the discontinuity across the region where the barrier was (right). As the two BECs interfere, the position of the interference fringes (peaks in the wave) depends on the relative phase between the two condensates. 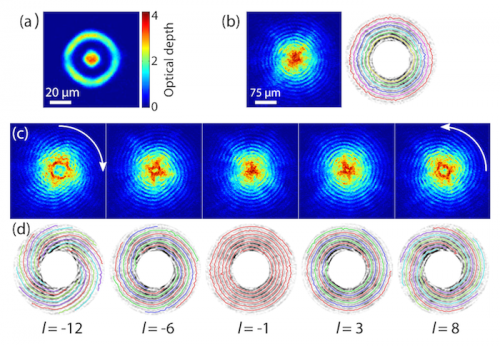 If a current is present in the outer ring-shaped BEC, the relative phase is changing as a function of the position of the ring, and the interference fringes assume a spiral pattern. 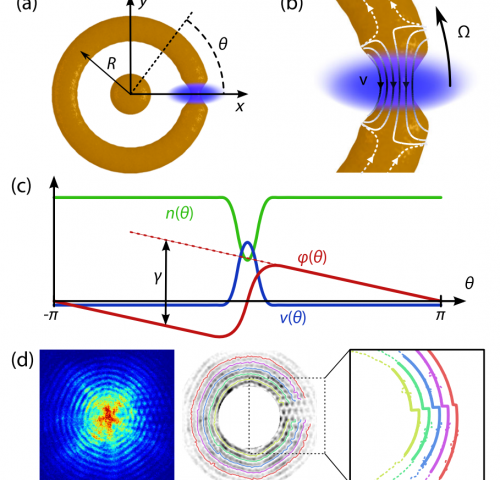 By tracing a single arm of the spiral a full 360 degrees and measuring the radial difference between the beginning and end of the trace, the researchers can extract the magnitude of the superfluid current present in the ring. They now know the current, so what about the phase across the weak link? The same interferometry process can be applied to the two sides of the weak link, again yielding a phase difference. When coupled with the measured current, the scientists now have a measure of how much current flows through the weak link as a function of the phase difference across the link, the current-phase relationship. For their system, the group found this dependence to be roughly linear (in agreement with their model). A different scenario, where the weak link has a smaller profile, might produce a different current response, one where non-linear effects play a larger role. Extending the same methods makes it possible to characterize these weak links as well, and could be used to verify a type of weak link called a Josephson junction, an important superconducting element, in a cold atom system. Characterizing the current-phase relationship of other atomtronic components should also be possible, broadening the capabilities of researchers to analyze and design new atomtronic systems. This same lab, led by JQI fellow Gretchen Campbell, had recently employed a weak link to demonstrate hysteresis, an important property of many electronic systems, in a cold atom circuit. Better characterizing the weak link itself may help realize more complex circuits. "We're very excited about this technique," Campbell says, "and hope that it will help us to design and understand more complicated systems in the future."